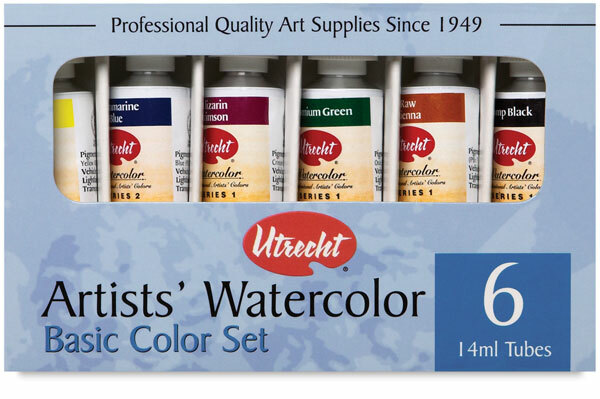 Offering artist-grade quality at a sensible price, Utrecht Artists' Watercolors are designed to meet the demanding standards of professional watercolorists for their most important, finalized works. Handcrafted for more than 50 years in Brooklyn, New York, they deliver clear, intense washes that flood the page with permanent brilliance. Every one of the 59 colors is milled with the finest pigments dispersed in pure gum arabic for excellent clarity and depth, strong staining power, luminous transparency, and outstanding lightfastness. 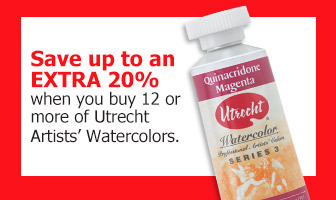 Don't be misled by the affordability of Utrecht Artists' Watercolors — they are comparable in quality to leading brands costing significantly more. Portrait Set of 12 — Expressly assembled for figurative art, these colors let you achieve natural flesh tones and the full range of light and shade required for portraiture. The 12, 0.47 oz (14 ml) tubes include Cadmium Yellow Medium Pure, Naples Yellow Hue, Cadmium Red Light Pure, Permanent Alizarin Crimson, Chromium Oxide Green, Cobalt Blue Pure, Ultramarine Blue, Raw Sienna, Burnt Sienna, Davey's Grey, Burnt Umber, and Lamp Black. Cadmium-Free Colors — Formulated with complex, high performance, blended organic pigments, this new range of eight colors offers enhanced vibrancy and flow when compared to their cadmium counterparts. Create fine lines and delicate washes — cadmium-free watercolors provide strong staining properties from a concentrated pool of color and retain their brilliance after they’re dry. 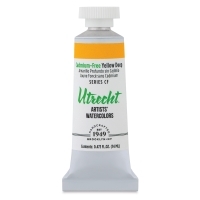 They are an excellent alternative to the cadmium color spaces in the Utrecht Artists’ Watercolors line, and their outstanding versatility and lightfastness measure up to cadmium color performance. Basic Set of 6 — Ideal for teachers and students, this selection of basic, essential colors contains 0.47 oz (14 ml) tubes of Lemon Yellow, Ultramarine Blue, Alizarin Crimson, Viridian, Raw Sienna, and Ivory Black. Landscape Set of 12 — This set contains key shades for capturing nature in every weather condition. The 12, 0.47 oz (14 ml) tubes include Lemon Yellow, English Yellow, Cadmium Red Light Pure, Permanent Alizarin Crimson, Hookers Green, Spring Green, Ultramarine Blue, Cerulean Blue Pure, Golden Earth, Indian Red, Burnt Umber, and Payne's Grey. 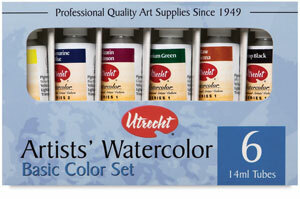 To view a PDF of Utrecht Artists' Watercolor Paints, please click here.